Barcelona will be the scene of an innovative and spectacular event in the world of sport. BARCELONA SNOW SHOW is a snowboard and ski competition held in the modality of Big Air, the most attractive and current discipline. From the modular construction of a springboard for large jumps and using the most advanced systems for creating artificial snow, BARCELONA SNOW SHOW creates the opportunity of having snow in the city. A premier sports infrastructure ensures the participation of the best world experts in the most successful modality and projection: freestyle. The snowboard competition will be part of the World Cup International Ski Federation (FIS). This competition is the proof test of the World Championship which will be held in La Molina in 2011. Besides being an exceptional sports competition, the event is also a fantastic visual show that will feature other activities, and a large shopping area. 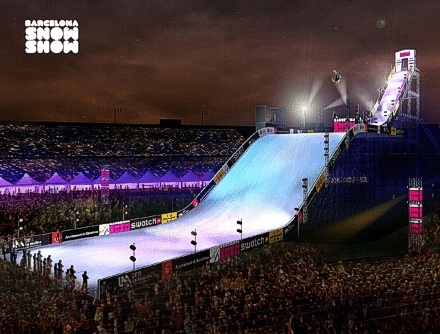 BARCELONA SNOW SHOW will achieve transporting viewers to a ski resort in the same mountain of Montjuic, offering a unique experience of the hand of the best riders of the moment.